Have some feedback on the Guides? Click here to leave your feedback & suggestions. Last edited by Rynetory2; 01-16-19 at 04:11 AM. Last edited by Rynetory2; 04-17-19 at 02:16 AM. Last edited by Rynetory2; 03-15-19 at 11:04 PM. Last edited by Rynetory2; 04-09-19 at 08:04 PM. Last edited by Rynetory2; 04-23-19 at 11:32 PM. Last edited by Rynetory2; 03-15-19 at 11:15 PM. Habitats can only hold a certain number of animals each. As you continue to raise more animals, you'll want to have more than one of each type of habitat to fit them all. There's a limit to the number of habitats you're allowed to have. As you level up, your limit will increase and you can build more habitats! Note: You can go higher than the maximum limit if you win habitats in events. Last edited by Rynetory2; 03-13-19 at 03:19 AM. Autumn animals find any and all amenities they need in the Autumn Atrium. Last edited by Rynetory2; 03-18-19 at 11:57 PM. 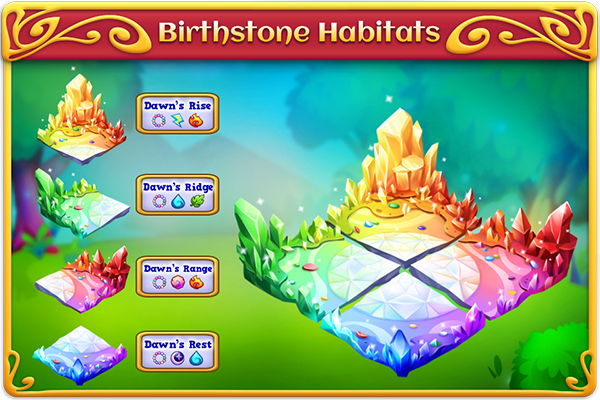 Get all four habitats and place them together to complete Dawn's Domain! Home to Birthstone, Fire and Lightning type creatures. Home to Birthstone, Dark and Water type creatures. Home to Birthstone, Earth and Fire type creatures. Home to Birthstone, Nature and Water type creatures. Last edited by Rynetory2; 03-18-19 at 11:52 PM. Bombs, bombs, everywhere! The echoing blasts heard throughout these green hills will make bomb collectors feel right at home! Last edited by Rynetory2; 10-06-18 at 10:53 PM.